After a very long winter with too many dark days and more snow than we are comfortable with here in the Pacific Northwest, signs of spring have finally arrived—cherry blossoms are just about to pop and tulip season is right around the corner! With the change in weather also comes a change in my sewing line up. Time to start stashing away the heavy knits and bring out color, color and more color. All the plants are getting a fresh start, my spring wardrobe can too! Now where to begin? I like to say that most of my sewing projects are done in reverse. I find some sort of inspiration and then figure out how to make that happen. I love the challenge of finding the perfect pairing of fabric and pattern(s) to create the perfect look. For those of you that have followed along on some of my past projects, it is no secret that Anthropology is one of my favorite sources of inspiration. This kind of developed out of necessity as I could wear or decorate with just about anything in that store, however my budget thinks otherwise! My answer, treat myself every now and then and recreate the looks that I can for a fraction of the price! Below: One of my favorite Anthro-inspired looks from this winter, read about it HERE. 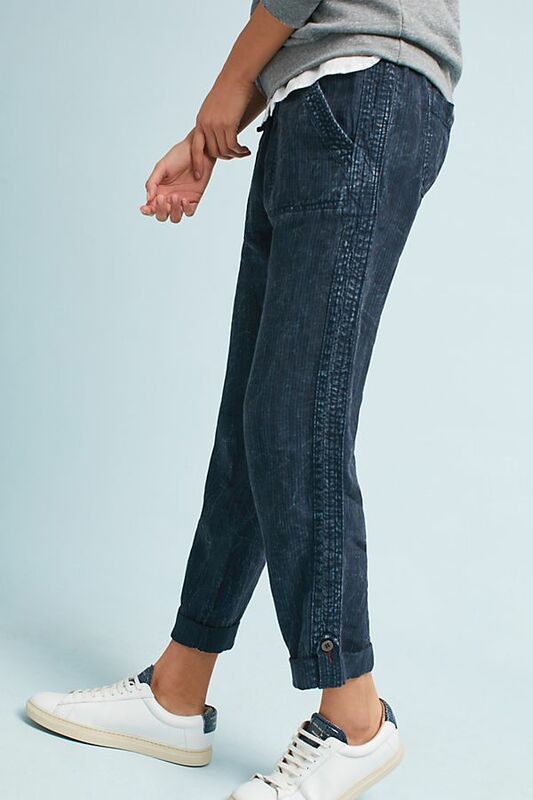 It really started with the bag (which stopped my finger in it’s scrolling tracks), but then I totally fell in love with the “denim” joggers! After clicking thru the links I knew I needed to recreate these casual spring pants and pair them with a fun top for the tour. Simple, classic and perfect for a PNW spring. And before you ask, I am also trying to figure out recreating the basket-weave bag, but I am waiting on a couple supplies. I’m thinking maybe a tutorial post? Yes!? The other thing that has been getting my attention on social media lately is Roscoe Month. 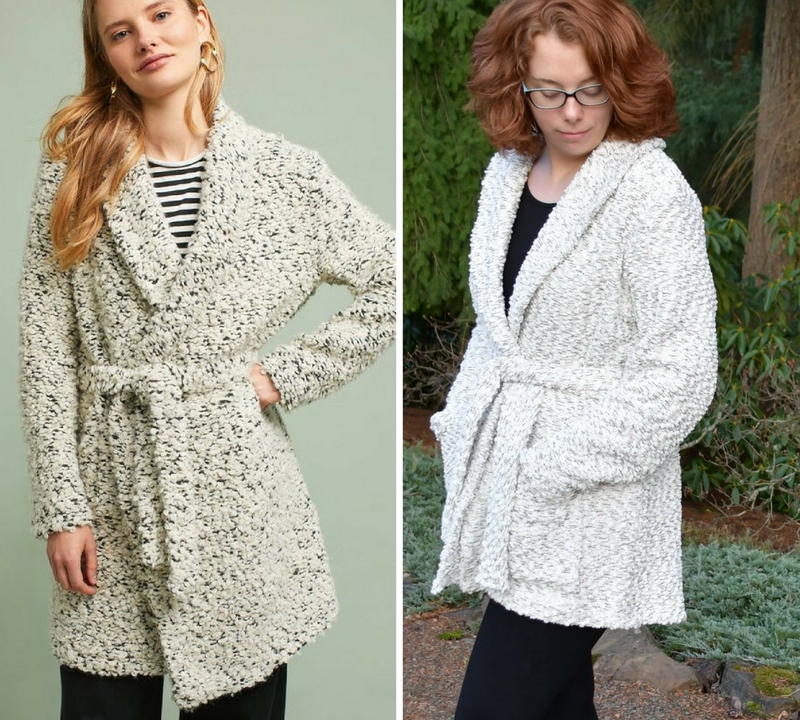 Kelli, of True Bias, has dedicated the month of March to her Roscoe pattern and she is sharing new versions on her blog all month long! 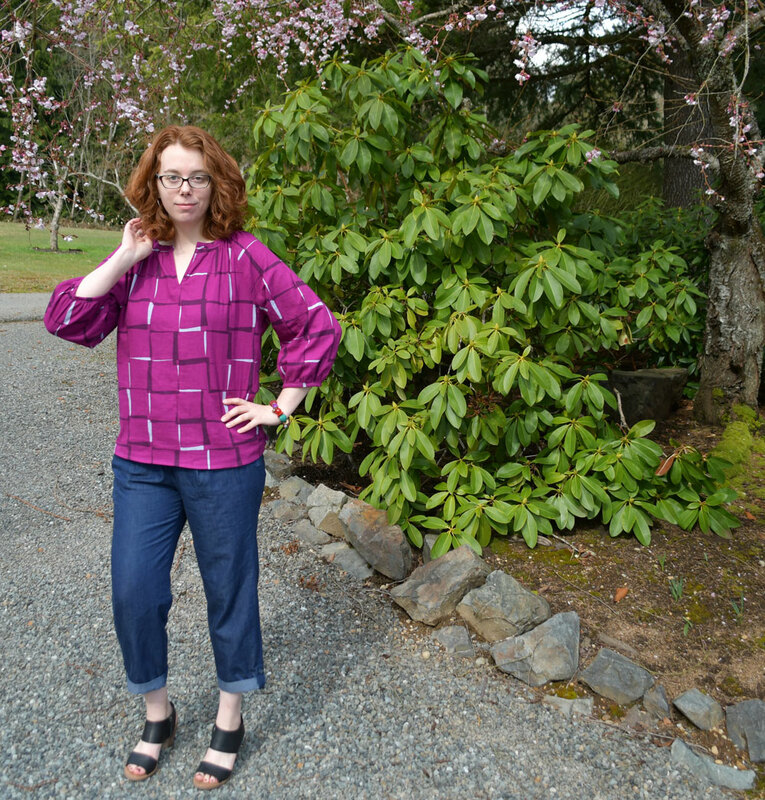 As one of my TNT patterns, I thought this might be the perfect choice to pair with my joggers. Now the question is, what fabrics and patterns to pick for both of these projects? As a red head I tend to stay away from pastels and lighter colors which is a bit backwards for spring I know. 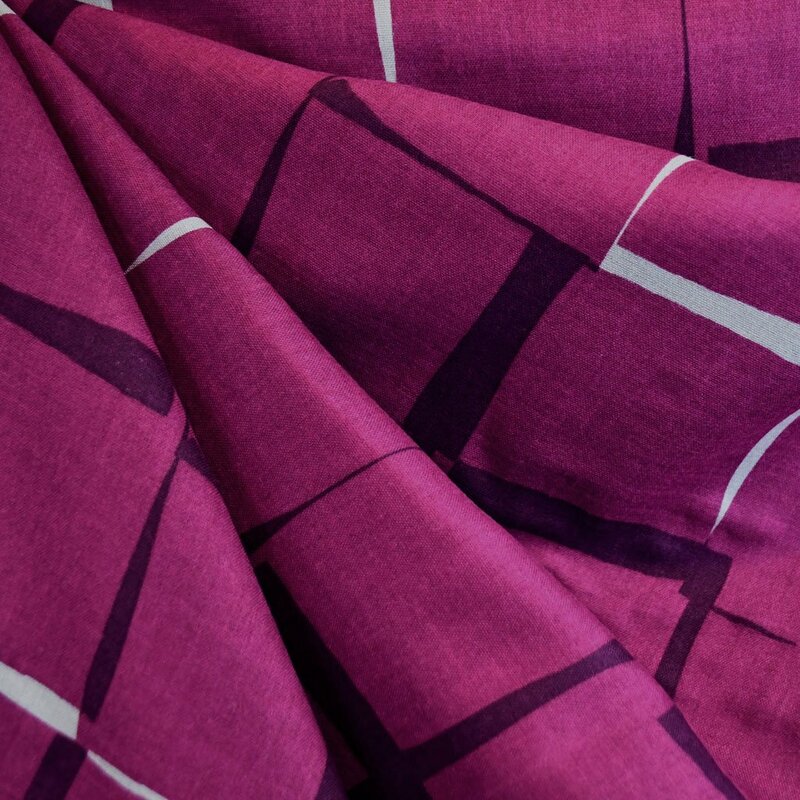 As a compromise I settled on one of my favorite fabrics for my Roscoe, Japanese double gauze in a gorgeous plum/grey combination. In line with the color of the season, lavender, just a shade that will pair better with my style! 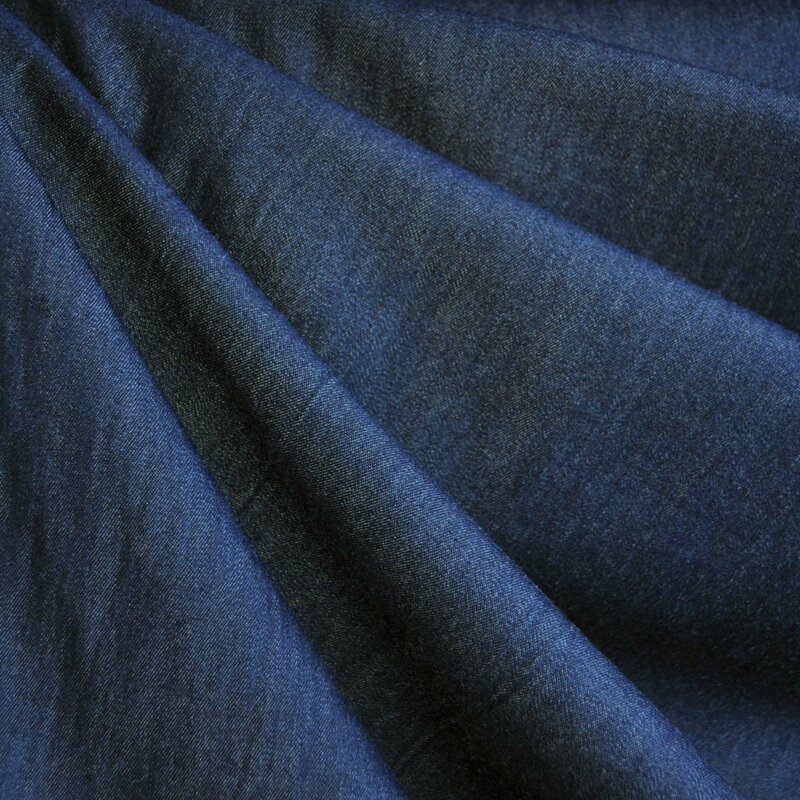 For the joggers, I wanted a lighter weight woven with a bit of drape and decided on this gorgeous modal denim shirting. The perfect weight for these pants, not to light and not to heavy. After getting everything pre-washed (a must, especially for double gauze) it was time to get sewing! I decided on the Named Alexandria Peg Trousers as my base for my joggers. 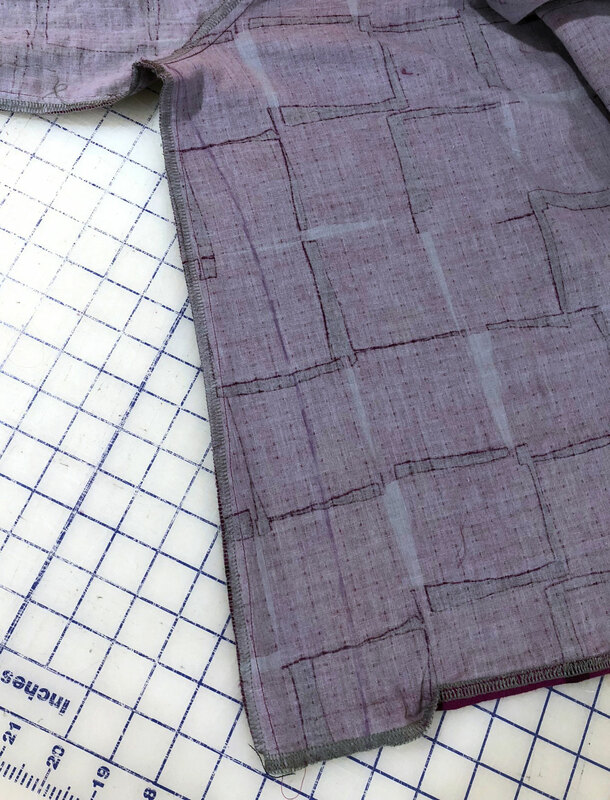 Based on the fit of the pattern and the finished measurements, I widened the legs about 3″ total grading out from about mid-hip and adding 3/4″ to either side on the front and back pieces. 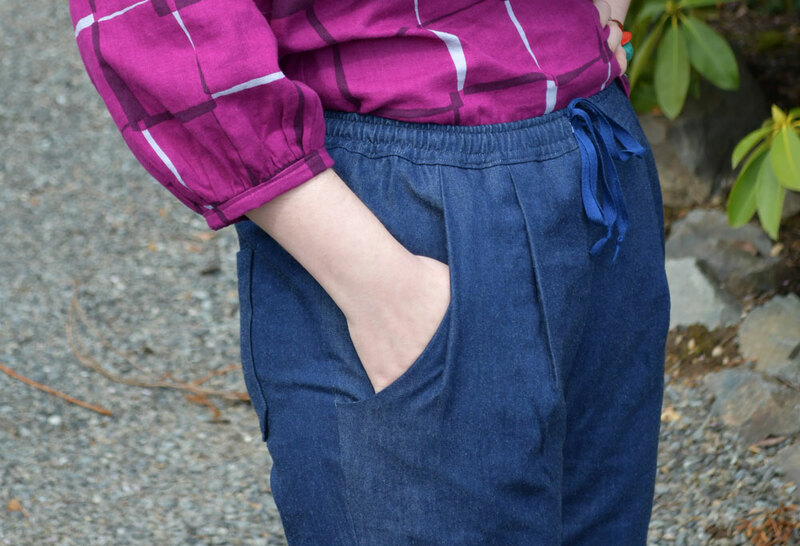 I didn’t make any other changes to the construction of the pant until the end detail at the hem. 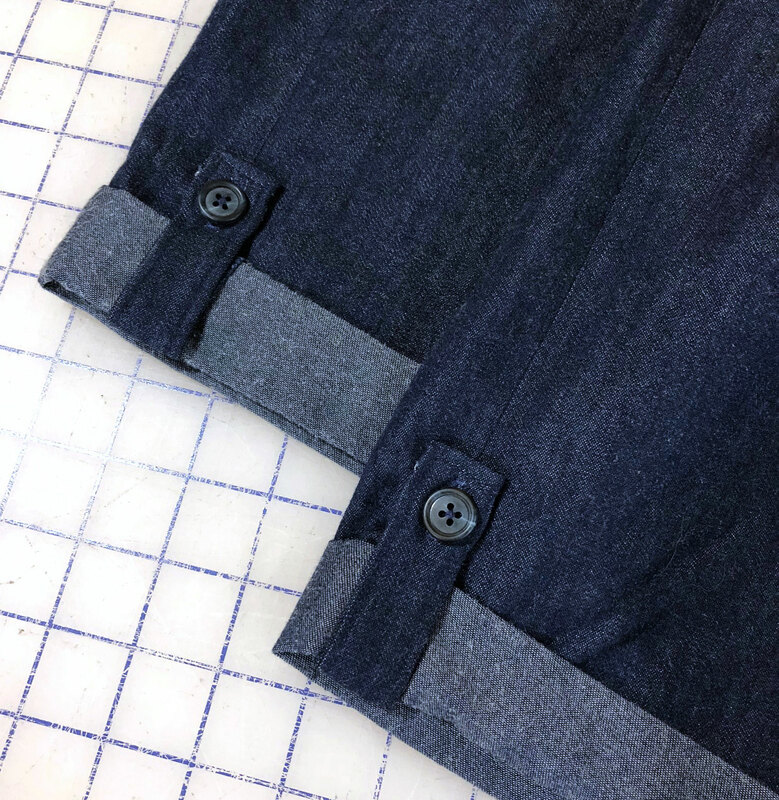 To create the tab detail I cut (2) 3″ strips of the denim and pressed them in half lengthwise. I wasn’t too worried about the length yet and left them about 10″ long. I then pressed the raw edges to the center similar to bias binding, creating a four layer strip. I also folded one end to the inside about 1/4″ and top-stitched down the two long edges and across the finished end. I then added a button hole to the finished end of each tab. You could skip this step and just sew on a the button thru the tab and the pant leg to simplify things. To attach the tab I adjusted the folded cuffs where I wanted them, pinned them in place and then played with the tap placement. I ended up lining it up right on the pressed open outside side seam and attached it to the inside by stitching a small box. Be sure to have the tab lined up how you want it to appear on the outside, ie right side up and with the finished end. I sewed on the button and I was done. Easy right! Now for my Rosoce I wanted to make this version a little different and decided to forgo the front ties. I finished the neck as directed, just leaving the ties out completely. To highlight the neck a little more I also shortened the neck slit by 1″ and widened the neck binding from 2″ to 3″. After I got my top all finished I decided the heavier drape of the double gauze gave the top a bit too much body around my middle so I tapered in the side seam about 2″ either side, front and back. This took out a total of about 8″ around the hem and gave a better fit. I love how both garments turned out and I am anxious to see how they wear. Both fabrics will continue to soften as they are washed and loved making them even better. If you haven’t sewn with Japanese double gauze, what have you been waiting for! It is the perfect fabric for spring! 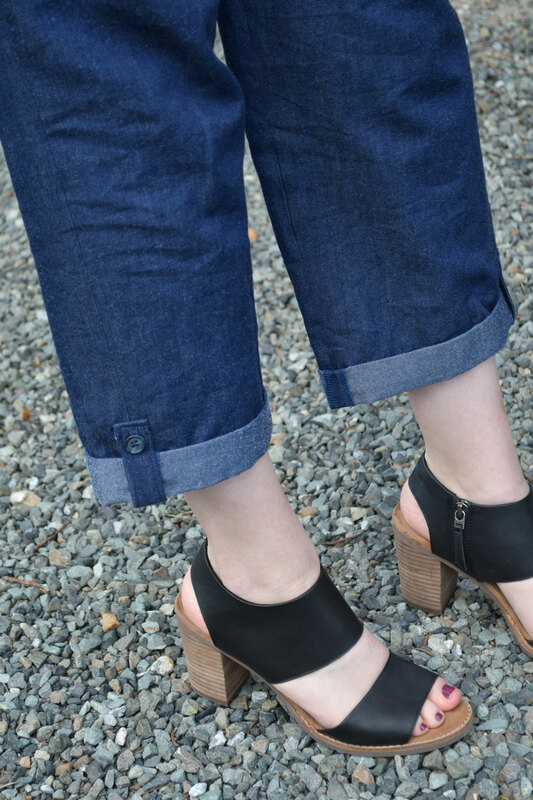 And I am loving all the dark denim, a staple in my wardrobe for sure! All in all, I think these are a great start to some new pieces for my spring wardrobe and I can’t wait to mix and match them with other staples. That wraps up Day One of our Spring Style Tour 2018! I can’t wait to see what the rest of the amazing seamstresses have in store for us over the next two weeks. Maddie is up tomorrow for Day Two with a spring coat and gorgeous shades of coral. Get the full line up and links to each stop in our spring launch post HERE. Wow, Michelle!!! Love the whole outfit. The fabrics are yummy and the colors are beautiful. Love what you did with the pants. The only problem is with double gauze on top and modal on the bottom how do you not just fall asleep in coziness?! I would be constantly petting myself! Looking forward to the rest of the makes but I have already ordered fabrics that I cannot live without. Happy Spring! I love your entire outfit and the changes to your Roscoe blouse is perfect. Beautiful and perfectly stylish outfit. 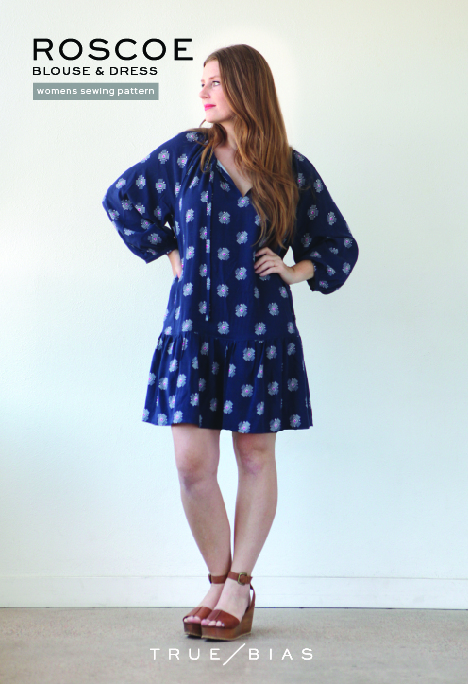 Your version of the Roscoe has me interested – the original is just too much fabric for me! 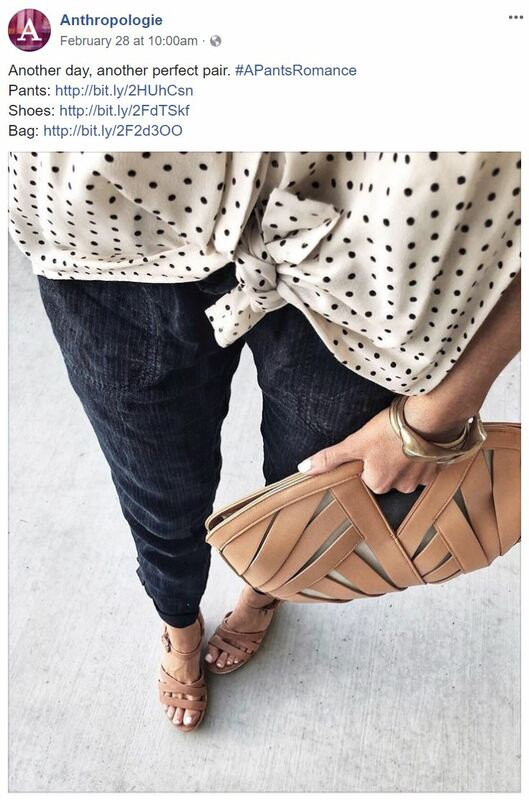 Great looking outfit – wouldn’t have thought of denim shirting for pants – lots of inspiration! I’ve loved the Roscoe blouse since I saw a woman who worked in a fabric store in LA wearing one and asked her about it. But I LOVE your version the most of any I’ve seen. Beautiful fabric! Beautiful! I enjoy seeing your creative process.